Feast your eyes book fans! 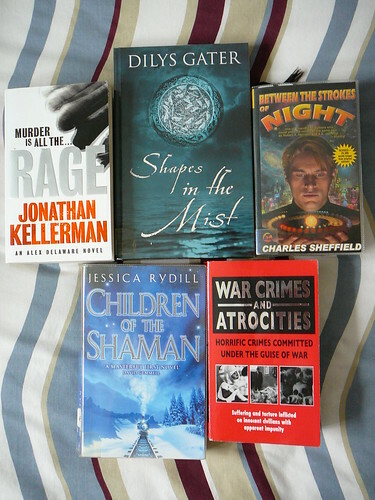 All picked up on Saturday at the local library in their regular book sale for, get this, 20p each! Earlier today we went to Lidl and let me tell you, I’ve now officially seen it all! We were half way round the aisles, just next to the flapjacks and fairy cakes, where we were amazed to see two men on the floor hugging. No wait, they’re not hugging they’re fighting! Really! Rolling around on the floor, they’re both about 50 or even 60, but sure enough fighting, one on top of the other giving it fists. I’ve had a pain in my left shoulder/neck for a couple of days. I think I slept funny and have trapped a nerve. I’m a little bit worried that since I woke up this morning I’m also experiencing numbness/pins and needles in 3 fingers on that side. I’m interested to see that Smoking drivers risk prosecution. this is not just because I dont smoke any more, back when I did I never smoked and drived because I thought it wasnt safe. Gwen Stefani on Ant & Dec, 6/10 not very good, perhaps she is jet-lagged. What the heck has she got on her head? This is “Black Forest Ham” so maybe this is forest garb, perhaps she is smuggling apples out of the forest?? I was sure I would win Euromillions this week (as I have since it started) but didnt. I’m still harvesting tomatoes and (thank you so much Carol Klein but you’re wrong!) not nearly ready to stop! I finally watched Spiderman 3, lets just say I’m hoping they turn this trilogy into a quadrilogy! So, eerrrr, that’s my return to blogging, did you miss me? Computers are meant to make life easier, but somehow it doesn’t always work out that way. Take my desktop machine for example, a couple of weeks ago it started being quite annoying. Firstly some programs refused to load, any attempt to open them would cause a blue screen error that shut the PC down completely. The programs seem quite innocuous and unconnected, a webcam thingy, a video editing thing and a Sega Megadrive emulator. There may be a connection in the way they all access some video hardware or something but I’m just guessing. Anyway, a few days later and Quicktime movies stop working and similar crashes occur when you try. Actually that video connection seems stronger now. I’ve tried the System Restore feature of Windows but it wont go back very far, probably due to the drive letter and partition changes I made a few days before. At this stage I’m beginning to think that a clean install of Windows may be in order. The problem with this is that the drive that Windows is installed on is more than half full of various movies, music and other downloaded detritus. Whatever the reason, the fact is its going to take some fancy juggling to get everything off the C: drive before I can restore Windows. Can you believe that I actually woke up at 4am one morning last week and spent an hour thinking about this? That’s right! I was on holiday thousands of miles away from the machine and I woke up and couldn’t sleep until I had a plan. So, I have a plan and now just need the time to do the juggling, to back up the most important stuff and then go for it. Afterwards of course I’ll need to re-install all the programs I use, Nero, Winamp, etc etc. So that’s going to be my Sunday I suppose. In theory, I should still have access to the Internet through the Laptop, since the router will remain connected independent of the desktop machine. Well that’s the theory anyway, If I disappear for a few days that will be why. However, given the frequency of my blog posts recently you may not even notice. I’m back, tanned, gorgeous and rested, well as rested as I ever am. I swear that sometimes I need a holiday to recover from a holiday! The trip got off to an interesting start when, 15 minutes into the flight, the Captain made an announcement. My brother, a nervous flier at the best of times, added a whimper to his usual repertoire. A few people around us managed a half-hearted attempt at humour, mostly by reminding everyone that it was the 11th of September. Yeah, we laughed too, NOT! We circled around for a while, I’m told we were dumping fuel, and then made our approached back into Manchester. Paul cant understand how I managed to sleep for about 10 minutes here, obviously I was thinking I might need to be fresh and alert for my ride on the emergency slide and the dash across the runway! You know that moment of anticipation as you feel the wheels are just about to touch the ground? I’m sure I heard the sound of a communal intake of breath spreading up the airplane, Mexican wave style, as everyone held their breath. He did get back on, though one couple didnt, and we were back underway within 2 hours. The holiday itself was great, Palmanova was nice, we were very close to the beach and our hotel was clean and spacious. I have some nice photos, I’ll post some soon. Just to rub it in, I’ll start the countdown here, its only 25 days to our next one! We are off to Majorca for a week, so I’ll leave you with these little gems. I mentioned earlier that I love (the font) Arial. Now I’ve seen this I’m a bit disgruntled. You are currently browsing the Andy2boyz's Weblog blog archives for September, 2007.